Thirteen years is a long time to wait for anything, but the decade-plus gap since Tool’s last album seems to be dragging on for an eternity. Various artists including Tom Morello claim to have heard it, and Maynard James Keenan himself said that there will be new music next year, but he could just be trolling us. 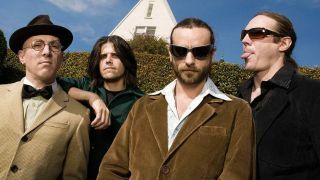 Tool have come a long way since their early days, when debut EP Opiate and its full-length follow-up Undertow made them the darlings of the alternative rock movement. Jump forward a couple of decades, and they’re better known for their lengthy and intricate epics than they are for succinct anthems like Sober and Stinkfist. Sure, it seems unlikely that the new album will be full of four-minute toe-tappers (or maybe it will, given how contrary they like to be), it would be great to have at least one or two short, sharp songs that people could actually sing along to without having to spend several hours learning lyrics and mastering tricky time signatures. Maynard James Keenan has always shrouded his lyrics in several layers of obfuscation and metaphorical tomfoolery. But one thing that’s been consistently and blindingly obvious is his disdain for the vacuous nature of modern life in general and America in particular. If the last 10 years of reality TV, religious conflicts and political idiocy hasn’t sent him into a furious rage, then we may as well all pack up and gone home. Let’s leave the blandness and self-absorption to the mainstream metal bands – we want some proper intellectual vitriol to wake us up. Okay, this one might run contrary to Tool’s reputation as one of the most self-contained bands around, but imagine if they opened things up to other artists. There’s precedence for it, after all: Henry Rollins chipped in with a cameo on Bottom, from Undertow. No, we’re talking about Myles Kennedy popping up with some syrupy harmonies on one track, and a duet between Keenan and serial collaborator Corey Taylor. But a guest solo from Robert Fripp of prog legends and former Tool touring buddies King Crimson or a rambling voiceover from cult comedian Doug Stanhope wouldn’t go amiss. Tool’s mystique hasn’t been harmed by their esoteric album covers, which reached a pinnacle with the CD version of 10,000 Days, which arrived with a pair of stereoscopic eyeglasses and some eye-frazzling artwork. The only problem with that approach is that the ante needs to be upped every time, though let’s face it, they have had a full decade to think about this one. Given the advances in technology over the last decade, the world is their oyster this time around: a miniature LCD screen embedded in the front of the artwork, perhaps, or a vinyl record made entirely from the hair of Donald Trump. Hey, we’d buy it. Hell, it might not even need to be a traditional album. R&B superstar Beyoncé turned the video album into a cultural event, and who better to push the concept to its limit than Tool? In keeping with their status as boundary-pushing artists, we’d be over the moon with something that elevates the visual side of things to the same level as the music – an hour-plus of the brain-melting weirdness that Tool have employed so effectively during their live shows. Failing that, just some visual evidence that all four members of the band still actually exist would be nice.